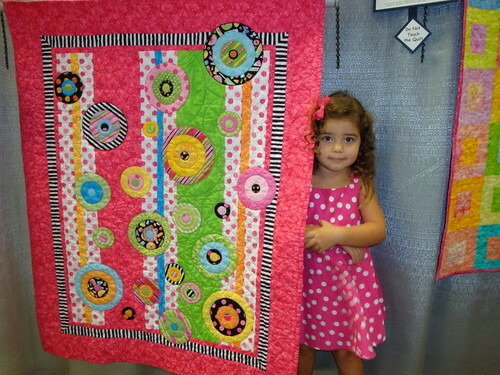 Nanann's Woogies & Whatnots | A blog about the woogies (quilts) I make and the whatnots in my life. 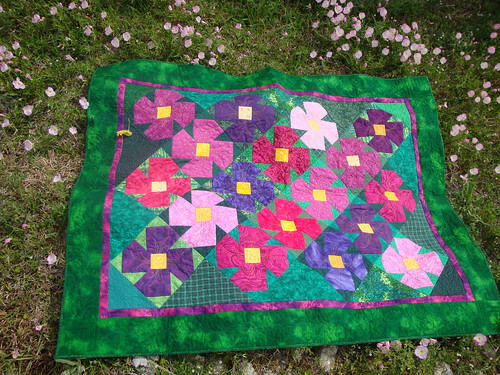 It is *always* better for someone to be enjoying a quilt rather than a UFO (unfinished object) sitting in your sewing room gathering dust. I finally took this to heart and finished up 2 UFOs and donated them! 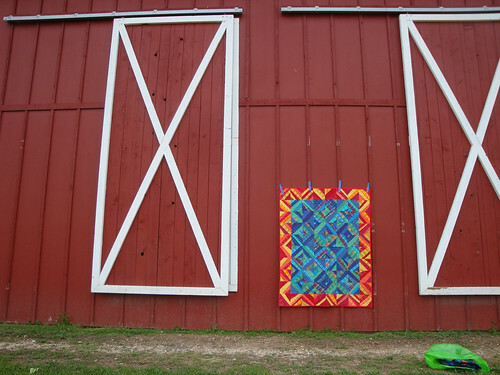 Each quilt measures about 66″x85″ — I think a great size for a man. Somebody in the group called these blocks a single-wedding-ring, but I can’t name it that with confidence. When I just googled that name, the block that popped up looked incredibly different. So I can’t help with those details. 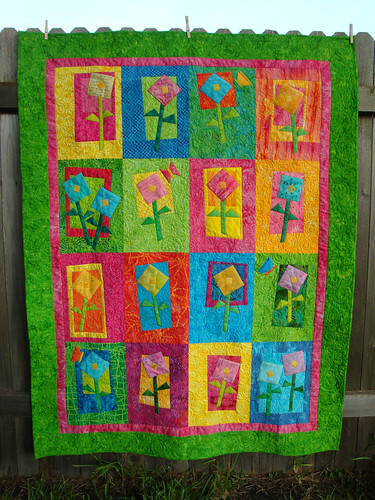 The blocks of this quilt were made so very many years ago! 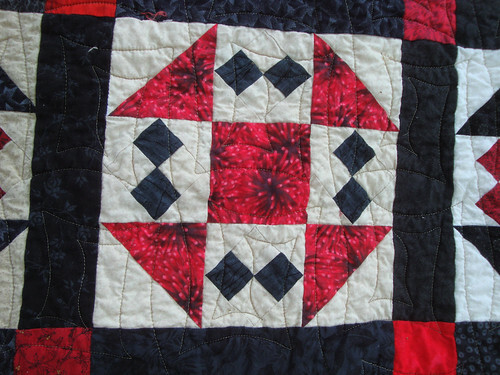 My fave red fabric, also highlighting my Mom’s square-spiral quilting. 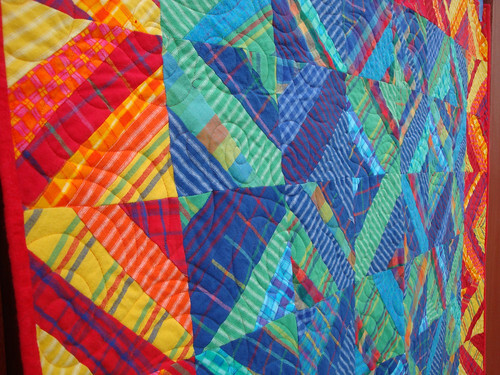 My mom finished the quilting for me LONG ago — a different design on each quilt if you notice – and then I put them in my closet. Perhaps my closet binding-fairies would finish them up completely, right? Um, no. 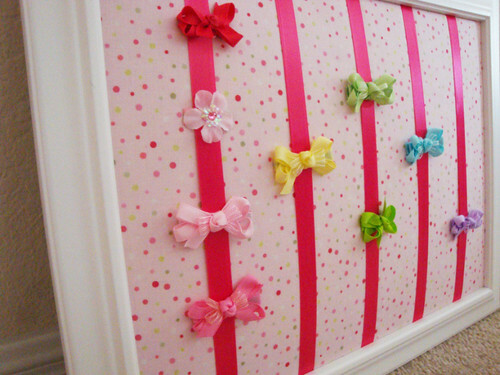 When that didn’t work and I finally got tired of all the space they were taking up in my closet, I did the binding. At the last guild meeting I donated them to my guild’s Red, White & Blue project. They assured me they were perfectly acceptable even if they weren’t technically red, white and blue. 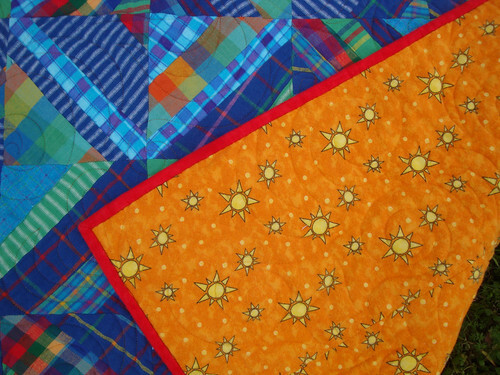 Our guild regularly delivers these quilts to wounded soldiers at Brooke Army Medical Center. 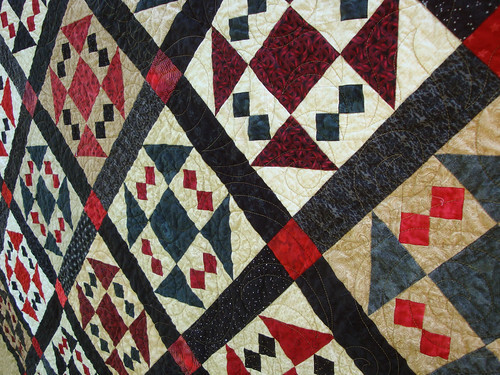 This quilt has more of a swirl design quilted on it. 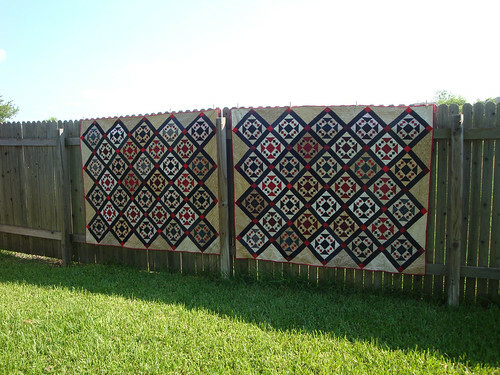 I did nearly have a heart attack after I finished these quilts. 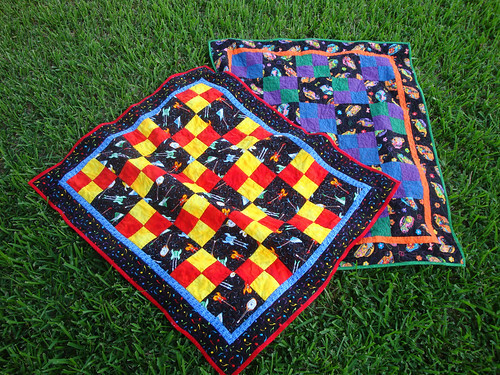 I don’t normally wash my quilts right away, preferring the pristine condition, but I threw these in the washer because they had cat hair on them. The last thing I would want to do is give someone an allergy attack when they snuggle with my quilt! Despite all the color catchers I threw in the wash too, one of the white/tan fabrics was a magnet for the red dye floating in the water. 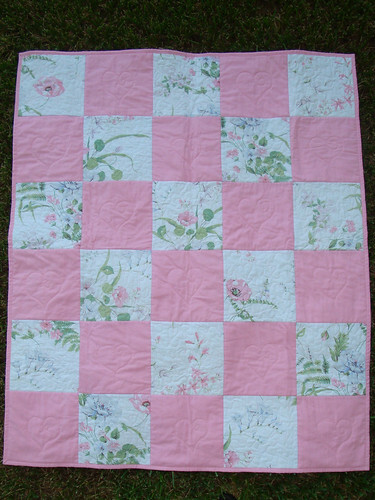 One block on each quilt, both made out of the same fabric, turned pink on me! Yikes! 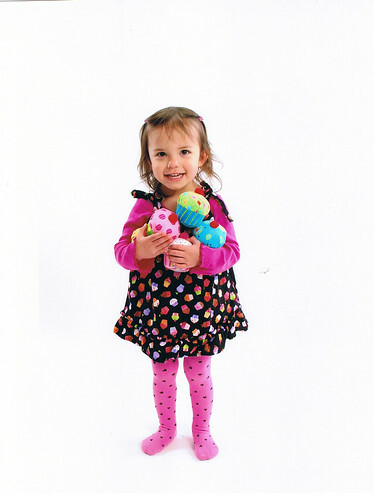 Piggies may seem to be an odd choice for a little girl’s dress. 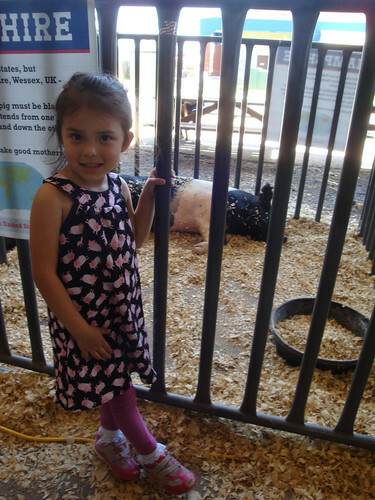 Julia at the rodeo, ecstatic to be holding a pig. 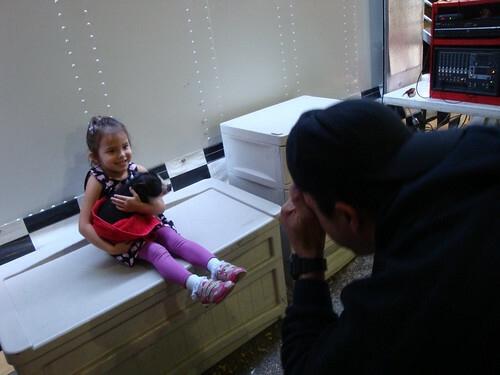 But if you ask Julia, it’s a perfect subject for a little girl’s dress! Julia is very proud of her ability to oink/snort. Very proud. And so it seemed quite natural to make her a dress full of little piggies. 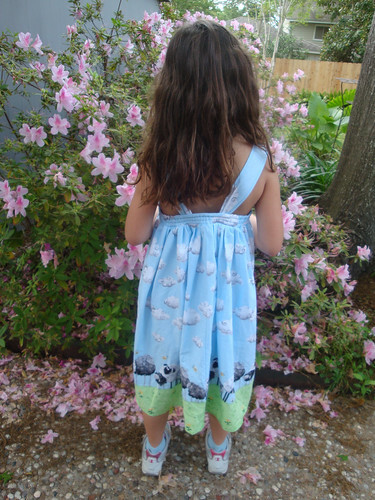 And although I’ve had this fabric for months, it wasn’t until I knew I was going to have an opportunity to take pictures of Julia with a real live pig that I got off my bottom and whipped up a pig dress for her! 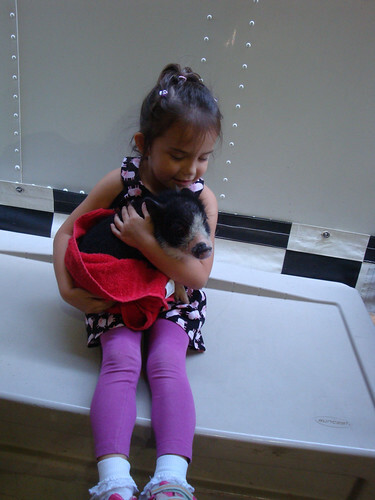 Yup, I had to shell out $5 for Julia to hold the pig. I also received a Polaroid. Just look at my tiny girl! The only reason that it seems an odd choice for Julia is that the silly girl barely eats. Unless it is a peanut-butter sandwich, pizza or cheese. Better shot of the front of the dress. This dress pattern is Simplicity 2270 – one I haven’t done before! I altered it, but it is barely noticeable. 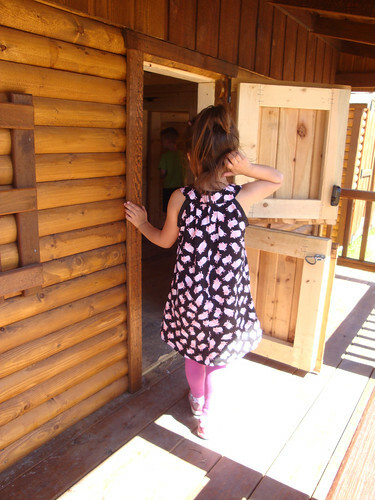 The dress has pockets, and in the pattern they are interior pockets but the front of the dress forms one side of the pockets. I’m having trouble explaining this, but, in other words, the pockets were sewn to the inside front of the dress, and therefore would have had visible sewing lines. I made them invisible pockets instead with 2 independent layers. Blah. Not only is it hard for me to figure out how to tell you about this, it took me a while to figure out how to do them, too. Not sure if I did them in the most efficient manner, but it worked and Julia of course likes her pockets. But from looking at it here you could never tell there were pockets! Back of dress, with well-hidden zipper. I’m starting to get confident with them! I did like this pattern and can see myself doing more dresses in this style. 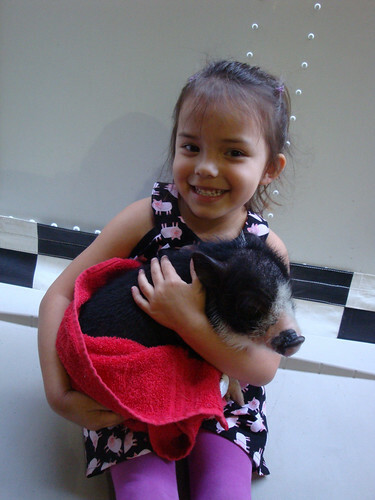 Julia posing with another pig. A few months ago my Mom and I were shopping at a quilt store together. We didn’t *need* anything, but you know, sometimes it is just necessary to see what the quilt stores have. 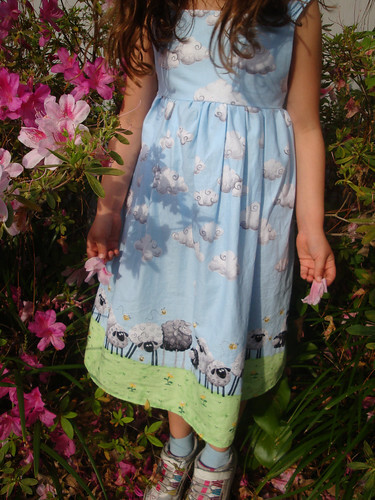 Well, we didn’t need anything until we saw this great sheep border fabric, and suddenly we *needed* to make Julia a new dress. I got the fabric home and washed it, as usual. 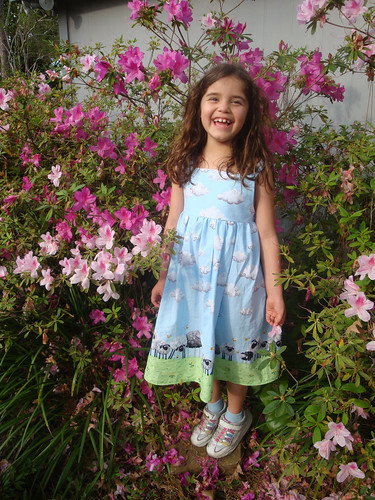 While folding it, Elena came over and insisted that she needed a dress made out of that sheep fabric! Hmmm. I called my Mom and we hemmed and hawed over that, thinking about how Elena is growing up and perhaps this fabric would just be too babyish for her. No final decision was made as it was still winter and I wasn’t making the dress anytime soon. 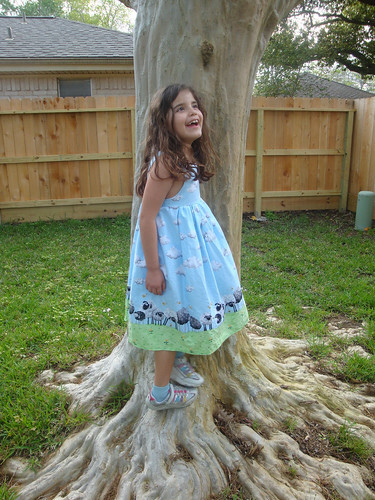 But you know what, when I brought out the fabric a couple weeks ago to make a dress for one of my girls, I finally came to the realization that my 6-year-old might seem really big, but she is still a little girl, and if she wants a dress made out of little sheep, then by gosh she’s going to get a dress with little sheep! My Mom whole-heartedly agreed. And the dress was made. 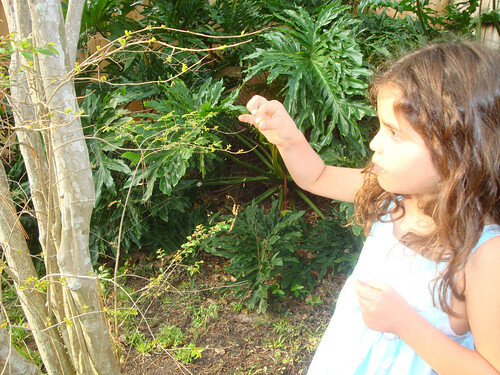 Elena just seems so big and grown up already, especially compared to her little sister. But seeing the dress on her, it is perfect and it is perfectly her. 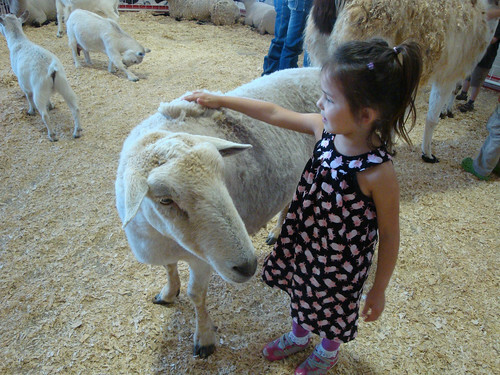 No matter how tall she is, she still needs lots of hugs, kisses, encouragement, and maybe even some cartoon sheep. This pattern is one I’ve used many, many times before: New Look 6613 (some of my previous version can be seen here and here.) I altered the pattern slightly — mainly because I couldn’t cut the bottom of the skirt in a curve as drawn as it would cut the sheep border off, and also because I wanted the skirt to twirl some more. There’s 2-yards’ length in that skirt! So I used the entire length that we bought, gathered it and attached it to the bodice. 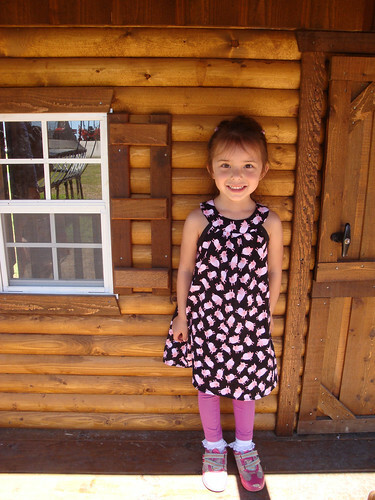 I made the dress a size or two too big because I’ve gotten caught on Elena growing out of things way too fast. I now sort of wish I made it a bit truer to size, but it is still cute and will last for a while hopefully! I put the straps close to the middle in the back of the dress hoping it would prevent them from falling down so much, but they still fall down some. I think maybe if I’d stuck with her size this would have worked better. Some good friends of ours recently found out that they are expecting a little boy in a few months. Of course this means I’m going to make a quilt, but in the meantime I thought it’d be fun to mail them a couple onesies to help celebrate. 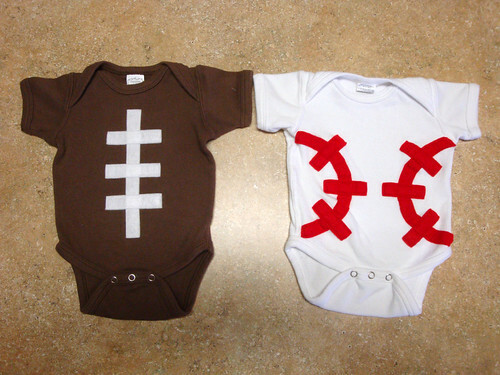 I admittedly got the idea to make these sports-themed onesies from someone else. 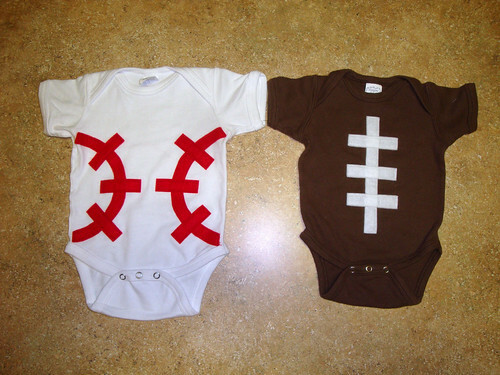 You can buy some great sports-ball onesies for yourself, instead of crafting them, at Bambino Balls. I’ve heard from a friend that they are great quality. 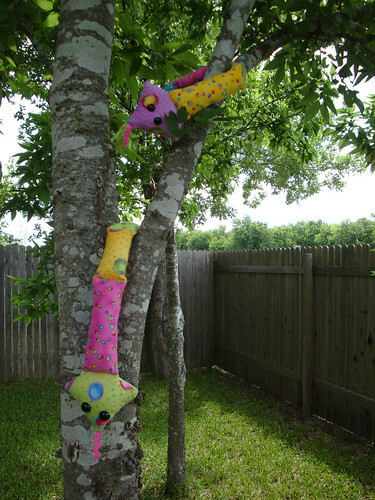 However, if you have some onesies and some felt, they are also pretty easy to make. I picked up my plain onesies from Hobby Lobby (yes, they carry plain brown!) and used some felt and Steam-a-Seam I had around. I then just ironed on the felt and stitched around it. Et Voila! 2 new onesies! And I include this seemingly nearly-identical picture to remind everyone to PREWASH! The onesies I picked up are incredibly soft and thick. And apparently shrink the heck all up in the wash. I had pre-washed the brown onesie before I started to make sure the brown wouldn’t bleed. I totally forgot about the white onesie because, hello, there wouldn’t be any bleeding issues, totally forgetting about shrinkage. The picture at the top of this post shows both onesies, both sized 6 months. The brown one has been washed but the white one has not. The white onesie looks HUGE! Yet they both started at the same size! The picture at the bottom of this post shows both onesies again, now both washed. (I washed because I now was worried that the red would bleed and wanted to be sure the gift wasn’t going to be ruined with it’s first use.) But look, now the white one seems smaller than the brown! Again, they started at the same size! And of course, by not pre-washing my felt got a bit funky. Ahh well. Still good enough to send for sure, but a good reminder to pre-wash, and perhaps also a pointer to not buy the smallest onesies at Hobby Lobby because they might shrink to nothing! 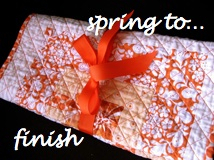 These will hopefully go in the mail tomorrow, and then I’ll continue quilt discussions with my husband for this new baby. He has definite opinions. 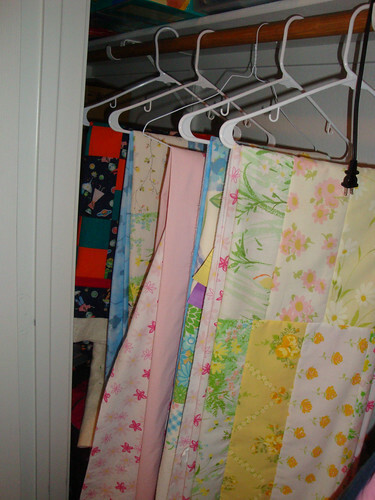 I’ve been *very* busy in the sewing room lately as I try to finish up using all of my vintage sheets. I just want them OUT of my sewing room — I’m tired of their half-polyester ways! I’m going to offer my scraps when I’m done to some local friends, and if that doesn’t work they’ll go on the guild’s free table- that’s how much I want them gone! 2 of these tops were just pieced this past weekend – one on Saturday and one on Sunday. I felt so accomplished! And, on my sewing room floor I have a gazillion (yup, I counted) scraps of batting that I’ve been piecing together to form the properly-sized battings for each of those 6 tops. 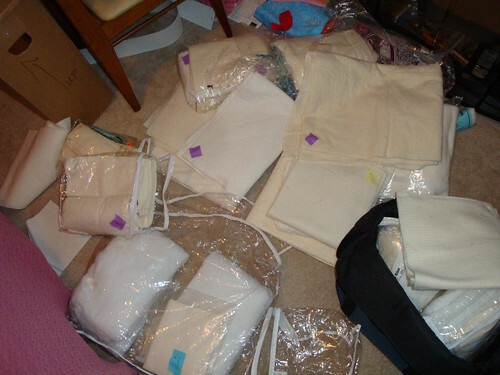 Many many many pieces of batting, thankfully labeled with their sizes to help figure out the piecing. Yikes! I only have one more batting that I have to piece and then these can go back to hiding in boxes. It’s been a bit of a chore admittedly trying to puzzle together similar pieces of batting – there are so many different kinds and sizes here! I can thank my Mom for all those lovely scraps of batting. 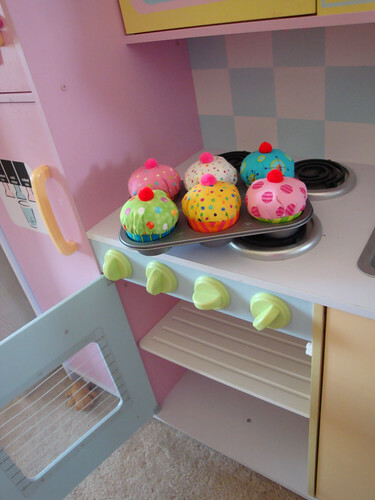 She often has pieces at the end of the bolt that she can’t use because they’re just too small, and she of course does not piece customers’ battings. 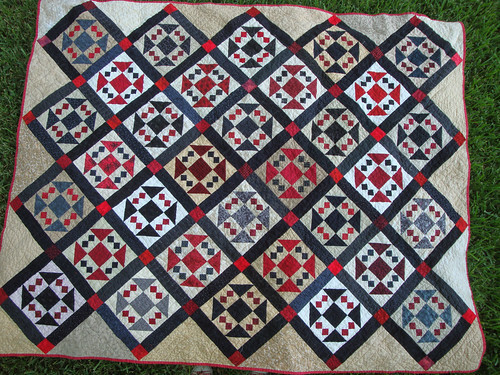 However, piecing a batting is perfectly acceptable and will last as long as you piece/fuse it well and then quilt well. 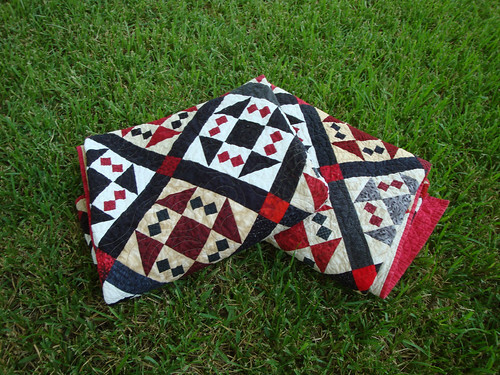 Nobody will know once these quilts are done that the middles were pieced. And then I get to baste all of these tops. Can’t say I’m looking forward to that, but I hope to do some tonight — the kitchen floor is mopped and ready! I definitely don’t have enough pins for all of them, though, so I’ll have to prioritize. I have one baby waiting for an alien quilt, so that’ll definitely be basted first. 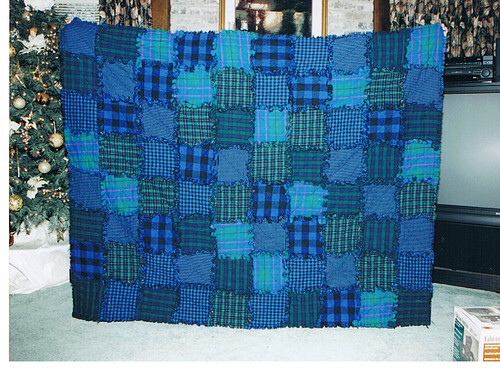 More than anything, I love snuggling under flannel quilts. Flannel just adds so much extra warm and cozy. 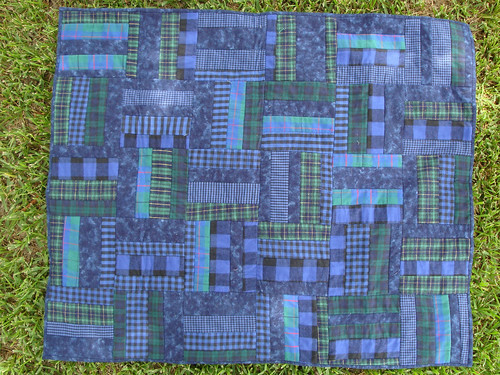 This flannel quilt in particular has been well used this fall and winter. Yup, well-used despite the 80-degree temperatures this February day. It’s so tiny! Well, not really, but on this big red barn it sure looks tiny! 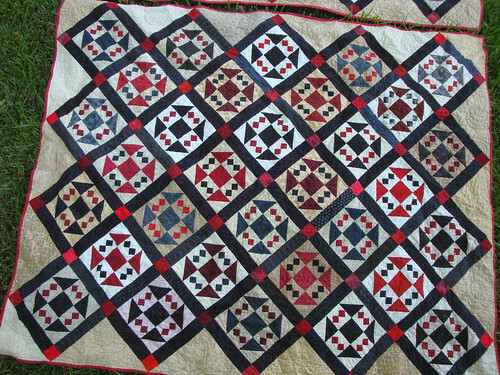 The quilt measures 48″ x 60″. 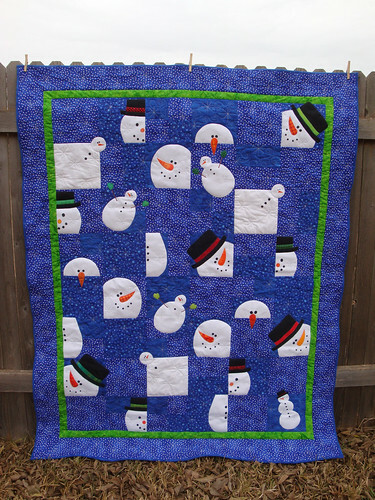 Some of you may remember this quilt, and especially remember helping me choose the layout for the blocks! 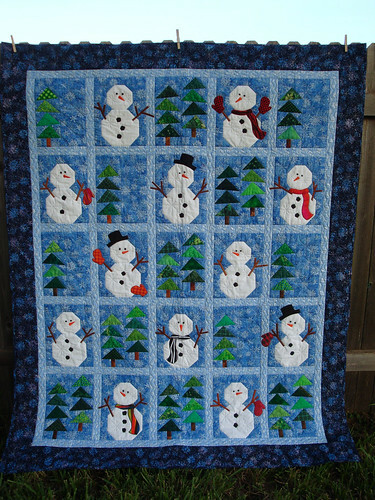 I made this quilt top, yikes!, 2 years ago this week! You can find all my previous posts while making the top here, here, here and here. 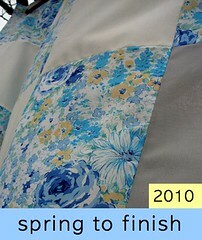 The top was finished during the challenge in 2010, but the quilt wasn’t bound and finished until 2011, and now I’m finally blogging it in 2012! 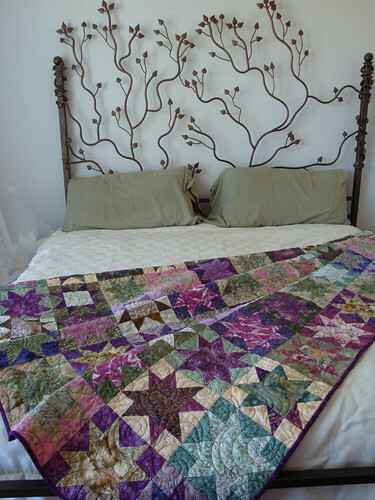 My mom did the fabulous quilting in a timely manner and returned the quilt to me promptly, as always. However, I decided it needed a flannel binding to complement its flannel front and back. 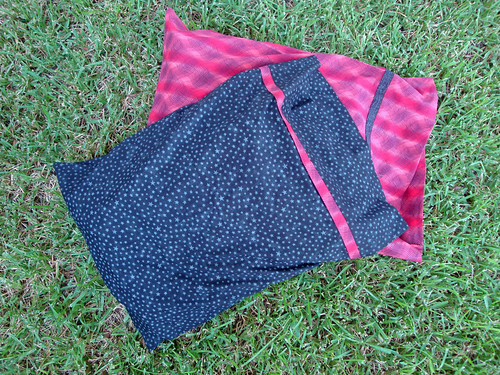 And of course I took my sweet time getting to the store to buy up some red flannel to make the binding! 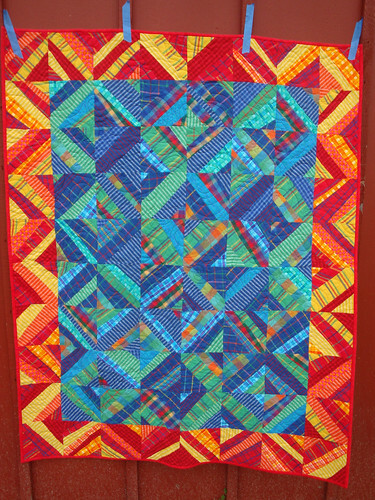 And so this quilt sat and waited for my attention, as all my quilts seem to do. I am definitely very happy to be snuggling under this quilt. And I’m also definitely happy to see this bright green lush grass above! I feared we’d never see green again around here after last summer’s drought! Of course, let’s not talk about how most of the green we see is all weeds now since most grass died out everywhere, and that we’re really still in a drought despite the rains we’ve luckily received of late…. If you aren’t already, I totally recommend following any blogs from your favorite fabric company. 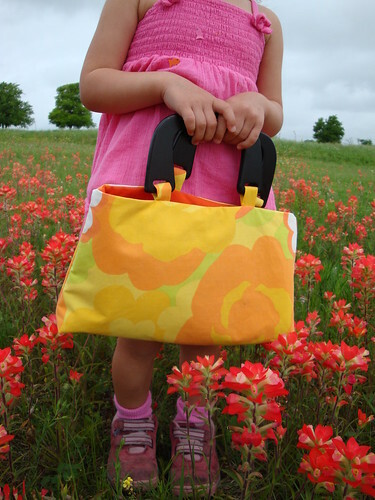 I have a few on my blog reader and I really like them because it is fun to see what fabric designs are coming out or being re-released, AND because the fabric companies often also put out patterns. 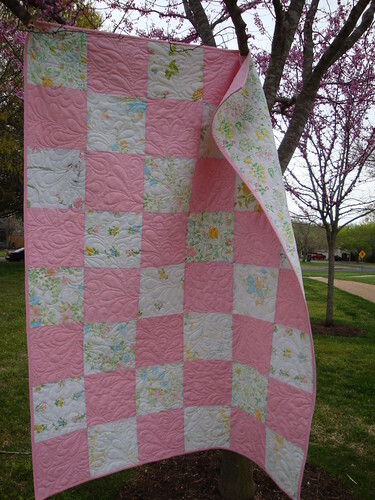 I think most quilters on blog land know all about the Moda Bakeshop, but other fabric company blogs I follow are from Michael Miller fabrics and Free Spirit. What is also admittedly quite fun is that some of them host fabric giveaways, and we all love getting free fabric, right? 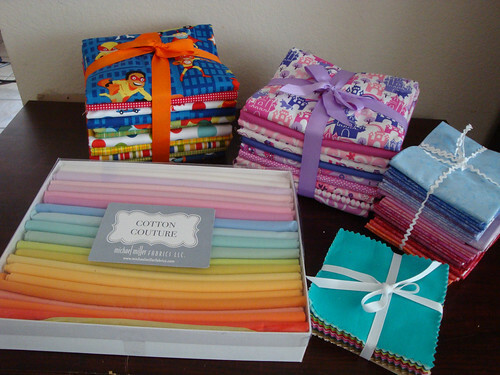 I also received 10 yards from the Once Upon a Time fabric line, several fat quarters from the Fairy Frost collection, several fat quarters of their new Cotton Couture solids, and a charm pack of all their solids! SO very exciting to open up that box! 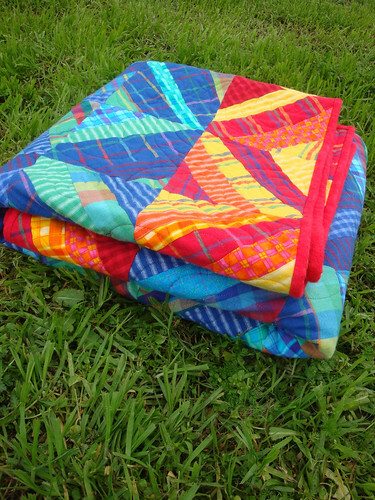 By the way, the Michael Miller regular fabrics have a great heavy weight that I’ve always loved about their fabrics — makes them super easy to quilt with. What I found surprising was how silky soft their cotton couture line was — a totally different weight! 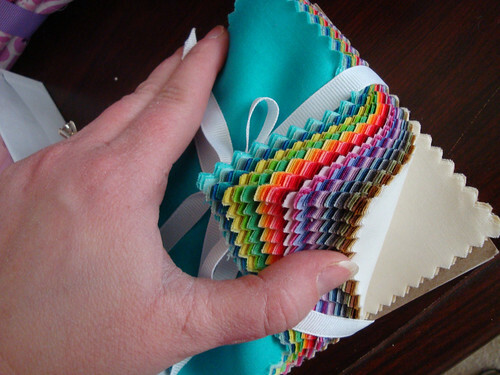 I’m sure they’ll be great for quilts as well, but I’m looking at getting one of the colors for a planned summer dress for one of my girls – the weight should be perfect. Now I’m sure you’re wondering what I’m going to do with all of this fabric, and to be honest I’m not sure. I have finished washing and folding it all and for now I’m admiring it. I think the pink fabrics will be turned into some dresses or skirts for my girls — that’s at least what Julia is requesting. 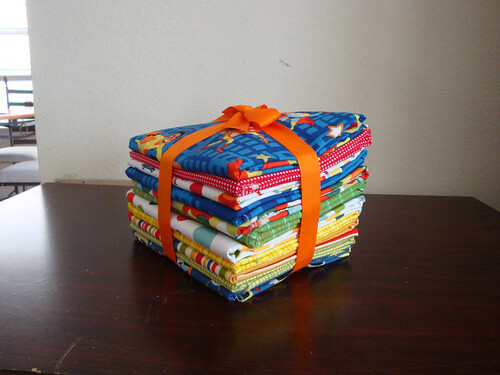 And I’m sure the original retro fabrics will be turned into a cute baby quilt or 2 or 3 — I know at least one baby boy about to arrive that needs a quilt! So, go out and have some fun with some Internet contests as well, although I definitely won’t promise you’ll hit the same jackpot I did!